Free international freight (Exclude tax/duty). Offerâ€™s not available in China. YikeBike Electric Bikes: Fully electric folding bike. YikeBike owners join an exclusive club in the world of people who appreciate and value design, freedom, innovation, and award winning products. YikeBike has been developed by a team who dared to change the world and believe in a better form of personal transport. Precise production and selection of unique materials means we can only manufacture to a select number of customers who appreciate value, quality and innovation. Itâ€™s a labour of love for our assembly technicians to ensure each vehicle is worthy of the YikeBike badge. Worldwide acclimation :- Appeared on the front page of TIME magazine, on permanent display at Londonâ€™s Design Museum, iF product design award winner, Guinness World Record holder, other design awards including: BEST Product design award, HiTech Hardware award, WIPO Innovative Inventions, German design award, Green Dot sustainability, and finalist in the â€˜Nobel Prizeâ€™ for sustainability. YikeBike design offers an indulgence, fun and freedom encompassed inside technology. YikeBike is a fashion statement and an extension of your personality. Innovative design delivers time, safety and efficiencies in portability. Every part of a YikeBike is for a reason and everything is in its place. Itâ€™s uncompromised design with structured clean lines balances both form and function. YikeBike is a mobile piece of art that stands proud and performs. 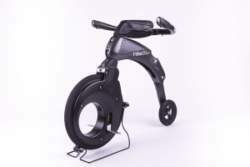 Visit the website of YikeBike Electric Bikes for more details. Click here.